If you think of professional athletes as “me-first” divas — who can blame you? — there is someone you should meet. Friday morning, he was in a neighborhood near you. 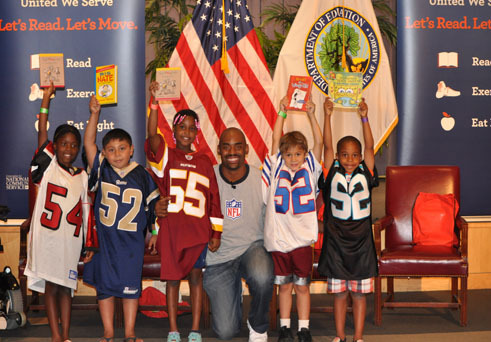 Chris Draft played 13 seasons in the National Football League, a career that tested his resolve, pushed his limits and, yes, padded his bank account. Beyond that, it provided an “in” for his life’s mission. Draft’s role as an NFL Ambassador brought him to Bloomington-Normal. He was on the job Thursday night when he spoke to the Illinois State football team. What he did Friday morning said a lot more about who he is, and the passion he has for impacting children, communities, you and me. After his ISU appearance was scheduled, Draft reached out to Evelyn Young, director of the Boys & Girls Club of Bloomington-Normal. Learning Friday was the final day of the club’s Summer Camp, Draft arranged to present his “Let’s Read and Let’s Move” program to campers. Rather than relax at a hotel until his 11:30 a.m. flight to Atlanta, Ga., he was at the Boys & Girls Club on Bloomington’s west side by 8 a.m.
“Being able to relate to folks who are younger has always been part of who I am,” said Draft, 35, a linebacker who played for seven NFL teams, including the Chicago Bears and St. Louis Rams. “It might not have been going to the Boys and Girls Club early on, but what I’ve encouraged people to do is realize that service starts at home. It is a mindset instilled by Draft’s parents, Tony and Rose. He grew up in Anaheim, Calif., the son of a Marine Corps officer. His grandfather served in the Army. He didn’t think twice Friday about waking early, driving to the Boys & Girls Club and connecting with a young, impressionable audience. He stressed the importance of reading through the children’s book he authored, “Do You Want to Play Catch?” Then, he got the campers up and moving. What was in it for him? “Knowing that something very small can mean the difference in somebody’s life,” Draft said. “I try to constantly think if I was 10 years old and an NFL player came and spoke, would I remember it? I know I would. Draft estimates he took as many notes in the NFL — he had to learn 13 defensive schemes — as he did in college. That’s saying something when you have an economics degree from Stanford University. Draft was taken in the sixth round by the Bears in 1998. He spent a year in Chicago, one in San Francisco, five in Atlanta, two each in Carolina and St. Louis, and one in Buffalo before being released last year by Washington. Now, he combines his work as an NFL Ambassador with running the Chris Draft Family Foundation established in 2006, when he was named Carolina’s Man of the Year. Yep, you should meet him.